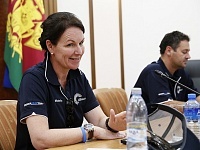 To this end, the delegation of the Australian cooperative CBH Group representatives has arrived to the Krasnodar Region. The meeting was held by Vice-governor Andrey Korobka. 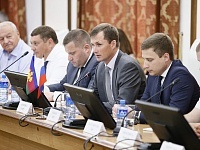 Fyodor Dereka - the Minister of agriculture of the region, Yuri Volkov - the Head of the investment Department of the region, farmers and agricultural cooperative of the Krasnodar Region took part in the meeting too. 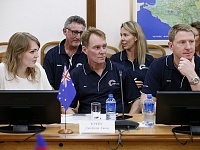 As Jason John Craig, the general marketing and trading manager of the Australian cooperative CBH Group, has told, the aim of visit to the Krasnodar Region is acquaintance to technologies grain crops production by local farmers.  Annually, we visit the countries of the Southern Asia where we adopt experience of foreign colleagues. This year we have changed our route for Russia, the Krasnodar Region as your country has intensively increased volumes in agricultural production, in particular regarding the grain crops,  Mr. Craig has emphasized. Andrey Korobka, in his turn, has informed the guests about the investment potential of the Krasnodar Region and peculiarities of agro-industrial complex. He has noted that more than 7 thousand agricultural enterprises work in the Krasnodar Region, and more than 1,5 million people are employed in that branch of economy. Today the share of the region in gross production of grain crops is 12 %, in Southern Federal District is 45 %. Every year we have consistently high grain crops harvest. It is our main export commodity. In 2017, the region for the first time became the third export region of wheat in the world after Western Australia, and Kansas, USA. We exported 8,1 million tons of grain. Taking into account the transit grain through our ports, more than 32,44 million tons of grain have been sent for export,  Andrey Korobka has noted. 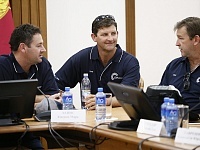 Australian farmers had particular interest to the fact that Krasnodar Regions authorities financially support agroindustrial complex in all directions. In 2018, State support of agricultural producers amounted about 8 billion rubles. More than 1 billion rubles was allocated for support of farm enterprises. During the meeting, the parties has also discussed tendency of development of agroindustrial complex of two regions, particularities of organization and work of agroindustrial cooperatives.